Average Weight	: 11 - 18 lbs. Photo Courtesy info : Schipperke Rescue Net, Inc. The Schipperke is a breed that is largely unfamiliar to the average American. But this is a great breed for those who want a watchdog or hunter that's not too big. The Schipperke is a dog of Belgian origin. 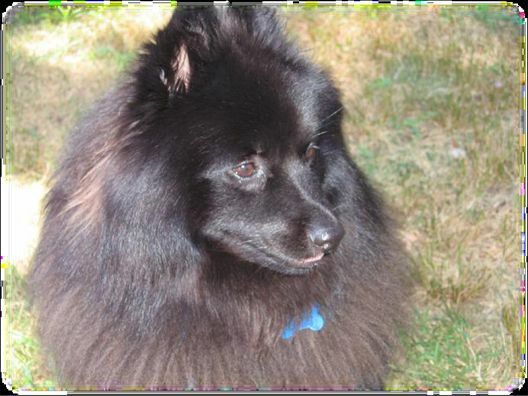 There has been much debate over the years as to whether Schipperke's are categorized as a terrier, spitz, or miniature sheepdog, though it is fairly certain that they descended from a breed of sheepdog. Many years ago, Schipperkes were also referred to as Spitzkes, Spitskes or Spits. In appearance, they strongly resemble the American Eskimo Spitz breed. The Schipperke was bred in Flanders by a canal boat captain named Renssens. It was descended from a 40-pound (18 kg) black sheepdog, known as the Leauvenaar, which is the same sheep-herding stock that the black Belgian Sheepdog descended from. The Schipperke was bred smaller and smaller and eventually became a different breed entirely. The dogs became a favorite choice to guard canal barges in Belgium. The breed was used for herding livestock, hunting game or simply guarding his domain. In Flemish the word "schip" means boat, hence where they got their name "Schipperke." They earned the nickname "Little Captain" and "Little Skipper" because the dogs were the "ratters," a very important function on a canal barge, and also usually the captain's dog. The breed became very popular in Belgian households by the late 1800s. It first appeared at a dog show in 1880. From that point on it was exported throughout the world. Schipperkes do very well on boats and people often get this breed to come along with them on boating and fishing trips. They makes a great guard dog when the boat anchors for the night, alerting of anything out of the ordinary and the dog thoroughly enjoys its trip. •	A quick, energetic little dog. •	High spirited, alert and self confident. •	Devoted, loyal. Great with children. •	Good with cats and other dogs. •	Smart, curious and mischievous. •	Do well on boats. •	A great guard dog ~ loves to defend its home against intruders, backing down from no one. •	Some can be challenging to housebreak. Patience and consistent training is required. •	Willing will take over if you don't demonstrate that you are the alpha leader in the pack. •	Without proper training can become a barker, with varying degrees of growling, snapping and even biting. •	Wary at first to newcomers. •	Love to go for long walks. •	Very clean with their medium-length double coat. While Schipperkes are not a popular family dog in the US, they make great companion animals. They are very good watchdogs are very devoted to their masters. At first meeting, you may find the Schipperke to seem a little aloof. However, this is because he is a bit wary of strangers. This trait is what makes him such a good watchdog. He will alert his owner to anything unusual by barking. He will defend his territory and his master faithfully. However, once he gets to know you, he is friendly and loving. Schipperkes are confident and independent dogs, as a result of having been bred to be small watchdogs and vermin hunters. Their size, accompanied with their temperament makes them an excellent breed for the apartment dweller who wants a protective dog. Schipperkes are good family dogs, particularly if your children are a little older. Young, untrained Schipperkes might not be very tolerant of toddlers. They typically will happily accept other pets in the home, except the occasional additional same gender dog. They usually do very well with cats. They are very intelligent dogs, but they can be a bit stubborn. Because of their natural tendency to hunt, you may find them chasing small animals outdoors and they may have a tendency to run from you when let off leash. Schipperkes have a very thick, medium length coat but it stays fairly clean. You should brush it regularly with a firm bristle brush, and dry shampoo it occasionally. Their coats do not need to be cut or trimmed. They shed very little on a regular basis, but their coats go through what is known as a "blow" as often as three times a year for females. When the coat blows, the entire undercoat is shed in about ten days. During this time, it's a good idea to bathe the dog and either brush them or use forced air to remove the hair two or three times during this ten day period. The shedding hair is itchy and uncomfortable to the dog, and leaves a big mess in your house, so it's best to groom them outdoors during this period, if possible. Once the blow period is over, Schipperkes look pretty much hairless for about 2-3 months, after which time a beautiful new coat will grow in. Males and spayed females shed less than unaltered females, and all of the dogs have fewer blow periods as they get older. You'll find that your Schipperke requires a lot of grooming attention during the blow period, but very little at other times. Schipperkes are extremely energetic dogs, and need their fair share of exercise. Giving them the opportunity to run free outdoors for a few minutes each day will keep them healthy and let them release some of their natural energy. If they're not exercised enough outdoors, you're likely to find them running around your house! These dogs really enjoy a play time, whether it's indoors or outdoors. Indoor games of fetch will help give them a bit of exercise between outdoor visits. Because of their natural intelligence and eagerness to learn, they are usually easy to train, if you are consistent and firm. But they are independent and strong willed, so you must train early and consistently. The one area where Schipperkes seem to be notoriously hard to train is in the area of housebreaking. For this reason, it's extremely important to be very firm and consistent when housebreaking your puppy. Whenever you're not actively engaging your Schipperke, he should be confined to his kennel to prevent accidents on your floor. Once he has begun to go to the bathroom on the floor, the bad habit has started and it will be very difficult to break. Never allow your Schipperke to roam freely about the house until he is thoroughly housebroken. This may seem unkind, but it is critical to proper house training. Plus, your puppy will come to love his kennel and feel at home in it. However, it is just as important that you provide him regular access to going to the bathroom in the appropriate place, and that you praise him effusively when he is successful. If you are consistent at keeping him confined so that he cannot have accidents and provide him regular opportunities to go to the bathroom outside, your Schipperke will master house training, though it may take a bit longer than with some other breeds. As mentioned before, early and consistent training of Schipperkes is critical. They are smart, but have a tendency to have a mind of their own. So, showing them who's boss early on is important. They tend to bark and howl, so you'll need to break them of this habit from the beginning. They often bark at the first sign of any noise or intrusion and their bark can be high pitched and extremely annoying. It's very important that your Schipperke not be left where he can annoy neighbors with his barking. Respect training is critical, and you must plan to enforce rules consistently. Because these dogs are independent, if they can find a way to avoid your rules, they will do so. However, once you have firmly established rules, and your Schipperke has learned to obey them, these dogs are great and faithful companions. Socializing your Schipperke is very important. Since these dogs are naturally wary of strangers, failure to socialize them may make them overly wary of people and of other dogs. Many experts recommend professional training for Schipperkes to ensure that all of the idiosyncrasies of the breed are considered during the training process. An untrained Schipperke can be a nuisance barker, prone to chasing things and may never adapt to people other than his owner. However, a well trained Schipperke will be able to use his natural traits to his advantage without letting them become overpowering and negative. Schipperkes are great escape artists. If you plan to leave yours outdoors alone, you must ensure that your fence is secure. You'll need a higher fence than you think to keep this little guy in, and he's also a threat to dig under it. Keep a close eye on your Schipperke outdoors until you're certain that your fence is secure.